Looking for the Best Apartments in Morrisville, PA? Morrisville, PA offers the best of both worlds -- scenic Bucks County is just around the corner, and you're in striking distance of Trenton and Philadelphia. Want to rent one of the best apartments in Morrisville, PA? Consider The Commons at Fallsington, a place to relax and put down roots. We're moments from all major roadways, so getting to work and school is a breeze. Cool off in the pool, and don't worry -- our round-the-clock maintenance has it covered. Every apartment features a washer/dryer, and pets are welcome. Did we mention that our award-winning school district features the county's highest-paid teachers? Morrisville is a place to live, learn, and grow. 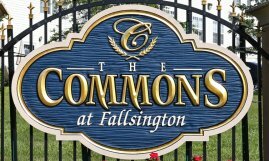 The Commons at Fallsington is waiting for you. Ask us about living here.